The digestion and absorption of nutrients is a complicated process which is regulated by the automatic nervous system. 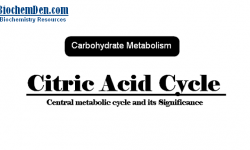 This occurs in association with peptide hormones of Gastro Intestinal Tract (GIT). The specialized cells lining the Gastro Intestinal Track are responsible for the production of Gastro Intestinal hormones. Hence Gastro Intestinal Track may be considered as the largest mass of cells that secrete hormones. A large number of Gastro Intestinal Track hormones have been identified. However, only Gastro Intestinal Track hormones have been well characterized. This hormone contains 17 amino acids and is produced by gastric HCl and pepsinogen (proenzyme of pepsin). The release of gastrin is stimulated by vagus nerve of stomach and partially digested proteins. 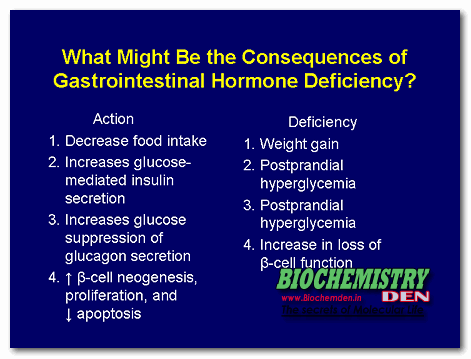 HCl and certain other hormones inhibit gastrin release. It is a 27 amino acid containing polypeptide and resembles glucagon in many ways. Secretin is synthesized by the mucosa of the upper small intestine. It is released in response to the presence of HCl in chime in the duodenum which is passed on from the stomach. Secretin stimulates pancreatic cells to produce bicarbonate (HCO3–) in order to neutralize HCl. It contains 33 amino acids and is produced by the upper part of small intestine. The secretion of CCK is stimulated by the upper part of small intestine. The secretion of CCK is stimulated by the products of protein and lipid digestion, namely peptides, amino acids, mono or diacylglycerols, fatty acids and glycerol. CCK stimulates the contraction of gall bladder and increases the flow of bile into duodenum. It also promotes the secretion of digestive enzymes and HCO3– from pancreas. It contains 43 amino acids and is produced by duodenal mucosa. The release of GIP is stimulated by the presence of glucose in the gut. The most important function of GIP is to stimulate the release of insulin from pancreas. This is evident from the fact that the plasma insulin level is elevated much before the increase in blood glucose. GIP also inhibits gastric HCl secretion, gastric motility and emptying.